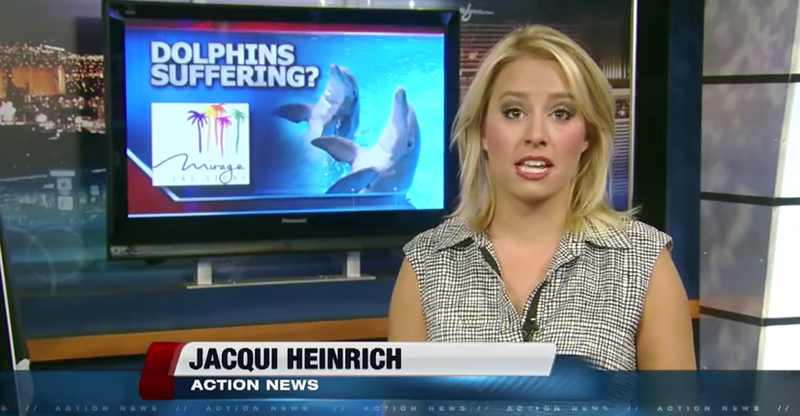 It has been over seven months since The Mirage (David Blasko specifically) told us and Ric O’Barry that the dolphins would be getting shade in time for summer 2015 at the habitat. At the time of writing this article, it is May 19th 2015, 12:22pm, 75°F with a UV index of 9. Those numbers are only going to continue to raise as we push deeper into the intense heat that comes with living in the Mojave desert. 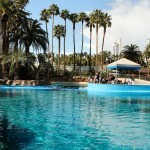 The trainers living at the Mirage facility will state that dolphins in the ocean do not have access to a shade structure, so one is not needed in captivity with the water temperatures are so easily controlled. Dolphins in the wild have the ability to swim down deep depths into the ocean, escaping the harsh rays. Captive dolphins spend the majority of their time lagging at the top of the surface, and exposure to the UV rays will burn and damage the skin of a dolphin just like it does the skin of a human. Section 3.103(b) of the Animal Welfare Act states: Facilities, Outdoor, Shelter: Natural or artificial shelter which is appropriate for the species concerned, when local climatic conditions are taken into consideration, shall be provided for all marine mammals kept outdoors to afford them protection from the weather or from direct sunlight. 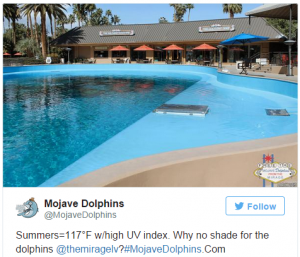 Why is the Mirage being allowed to deny the only dolphins in America being kept in the middle of a desert a shade structure, when we have an average of 210 sunny days a year, with the UV index being very high in summer? National Geographic ran a story back in 2013 about how dolphins and whales are being damaged from UV exposure. 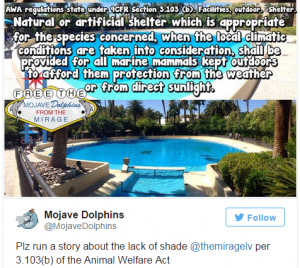 Shade for the tourists at the Mirage, but not the working dolphins. 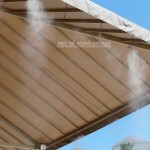 “It is easy for us to forget about UV rays because we can protect ourselves against them. But the whales can’t. They remind us: Ozone depletion is happening,” said Marie-Françoise Van Bressem, a veterinary scientist at the Peruvian Centre for Cetacean Research in Pucusana.